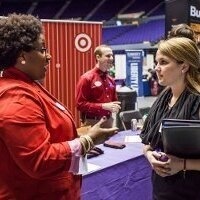 LSU's largest spring recruiting event, drawing hundreds of recruiters and over 1,500 students and alumni. There are opportunities for students in all fields and at all levels to network with professionals, learn about career options and graduate and professional programs, find out about open jobs, and explore their intended career fields. Questions? Contact the LSU Olinde Career Center at career@lsu.edu.